Streamline your warewashing operations with the Noble Products full-size combination / flatware rack! Made of polypropylene, this flatware rack is sturdy and durable, perfect for years of heavy use. The comfortable built-in handles allow for safe and easy transportation by your staff. Best of all, the handles are molded into all four sides for simple dish machine loading, without ever needing to rotate racks. Positive stacking from either direction makes this rack compatible with most major competitors. This rack is the best. It arrived quickly and DOES ITS JOB, which is more than I can say for my employees. I wish I could promote this rack to upper management. Easy to clean and store. Also unlike an employee. Durable and easy to use. Had to replace several dishwasher racks due to age and these worked just fine! I would recommend these for sure. Great price for a flat rack that we’ve used for drying pots and pans. Stacks empty with the peg rack and can be stacked with the compartment racks although they can be a bit snug. This Noble full size flatware rack is great for all flatware and smaller utensils. No worrying about loosing anything through the small holes. The only complaint I have is that the handles our on the bottom. The hot water from the dishwasher drips on our hands as we pull it out. These are a perfect size and standard for the Noble dishwasher that I bought. The product is really sturdy and durable and I would buy it again. Very nice dishwasher rack. Lite weight and easy to handle, but sturdy and will probably last a lifetime. I will be ordering more for my kitchen. Works well for utensils and smaller items. Fits in a ventless hobart dishmachine. Have not had any issues with it and the plastic is thick and sturdy. Great quality rack for washing my flatware and small tableware. Using two of these stacked together also allows for washing deli containers without them flying all over the place. Easy to use, light, very convenient to rinse and clean silverware. Fits into our commercial dishwasher easily. Keeps all the silverware inside rack, even small cute utensils like cheese knives. I never bought this brand before but when you have a budget you are open to buy out of your comfort zone. That been said, I wont regret the buy. Even with daily use this racks still look brand new. Easy to use and seems impossible to break. Throw on the silverware, give it a shake, and a rinse and the rack slides easily into any dishwasher. I tried to reorder some old ones but apparently they upgraded these. Only difference is the closed sidewalls. I didn't think I would like it at first, but after saving the headache of knives sliding out the sides...I am a fan! Great drying rack for your dishwasher or your sink keeps everything nice and organized and I would recommend this for anyone . Also it’s made of great material . This rack is standard fit for most dishwashers. We use it as a drying rack for hand washing, but it works well just the same. Great for washing silverware and some pots and pans in. Nothing falls through the holes so it works great running small items through your dishwasher. From manual washing to automated this Nobel Products Full Size Combo Flatware Rack with Closed Sides will become your best friend in the dish pit. It is light weight, crafted from quality material and construction. Finally a rack without huge holes! On our previous racks we have always had to place utensils carefully so they did not fall through. With this one I can just throw them in the rack with no worries. This flat ware rack fit perfectly in my dishwasher. The quality of the plastic is very durable and very inexpensive compared to other vendor brands. I bought these to dry soap on them. The size is perfect for me. I'll be getting more but with the open sides this time. This flatware rack works great for washing a decent amount of silverware at once. The utensils lay flat on here and are able to washed thoroughly due to this rack. Very strong rack! It is also good looking and easy to move everywhere. It is very big and a lot of pots fit very nicely. Recommended! This is a great rack for not only washing but also storage of Cambro/Dinex bowls. They stack very nicely. Great quality at a great value. Why pay more for a name brand rack. This one is perfect for my nursing home washing and storage needs. Excellent flatware rack! These are made of sturdy plastic that I think will last a good while! The sides allow us to stack more than just flatware, the pattern on the bottom is tight enough we don't have to worry about small wares falling through! Will purchase again. This flatware rack is was perfect for our food truck. We used it to store glass cups, dry dishes, and other appliances that needed storage. They were light, yet heavy duty, and easy to clean! We love the flatware dish washing rack. The closed sides make it easy to grab, and it ensures that we won't have any flying glassware in the washer. Classic these are made out of is wonderful they do not break or get brittle inside the dishwasher and I recommend that you buy multiples to save money they will ship direct. You need some clean ones of these. They are tidy and helpful. When the old ones wear away get these and never see them turn black and grey. Very great and useful, it fits everything not just silverware, we also use this for pots and pans. Very great value and sturdy we are going on one year and still in great shape. Great price and value! The full size flatware rack appears to be of good quality and is currently holding up well. After searching on line these came back at the right price and I am glad that I ordered them. Great dishwasher rack! Fits into our ecolab machine perfectly. Lots of holes for water to flow through easily, but we don't lose small tools like with our pegged dishwasher racks. Huge help at a fair price! These racks are so durable they resist shock impacts throwing metal relatively heavy flat ware inside them eveyday sometimes falling from counters or sink it is simply indestructible thx! This rack is great for cleaning forks, spoons, etc. They just do not stack well with other noble products. They slide around once stacked and need some sort of knob to stick out and catch the racks to hold together. We love the quality and durability of this flatware rack for our commercial dishwasher. We use it when we have lots of cutlery to wash all at once. Comes in box and is very well made. What you see is what you get. Use for extra place to dry cups and utensils in my bar. These racks are solid, stack well and made of durable material. We use these to stack the Carlisle Compartment Flatware racks and large pans and bowls. perfect for my needs, was not sure if I could use it, but was pleasantly surprised, great quality and great price, just what I needed. This rack fits perfectly on our sink, this is a requirement by our health department while washing dishes and it came in very handy, very sturdy! I bought this rack for my outdoor kitchen. This works perfect for what I wanted. It also makes clean up a breeze! The rack is extremely sturdy and light weight. The noble full size combo flatware rack and closed sides are very well built and sturdy for the price. One of the lowest you will find and are holding up well. These Noble racks are amazing. Flatware wont fall thru. They work so well at the restaurant that I bought one for my house. Great price point compared to my local restaurant supply store. Work great. And as I said in another review, these are super economical compared to other brands hold up just the same. We put it in a 20x20 dishwasher and it fits great. Great, must-have rack. We use this to wash and sanitize our silver ware. Works just as described- flatware will not fall through. These are very sturdy racks that will undoubtedly hold up to years and years of use. Our kitchen staff needed to replace their 10-year-old flatware racks. I purchased this product through Webstaurant knowing I will receive a great product with competitive pricing. We will reorder again. Dish washers dream here. These are perfect for silver ware, ramekins, or any small items you may be washing. Durable product as well. This is recommended. This tray makes all of the difference. You can throw just about anything into it and it will be safe from falling into the bottom of the dishwasher. Well made - very solid. We are utilizing these in our shop to store extra 5 oz. tasting glasses in - wonderful addition to our supplies. The full-size flatware rack stacks perfectly with our other racks and makes cleaning silverware easier than ever. The closed sides make it impossible for anything to slip out. We have used this for bigger platters, bowls and plates as well. Very durable and versatile. I love this silverware dish rack! The silverware no longer falls out the sides. The grey is a nice neutral color too which believe it or not is hard to find. I'm using all of the racks now including the one for dishes and glasses. Durable and great price point! Good product and they match up well with our existing name brand ones and the price is so much lower that I will not hesitate to reorder. These are great for washing flatware as well as larger items that don't fit on plate racks. 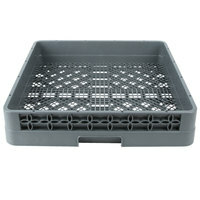 We use these for large bowls, pots, steam table pans, etc.